Guests are now able to enjoy wireless internet access, free of charge. We are happy to announce the introduction of the wireless Internet access point at Porto Azzurro Aparthotel. If your smartphone, laptop or tablet has a WIFI connection, you are now able to connect to our wireless internet, available throughout the hotel, free of charge. How to access our Free Wi-Fi? The front desk staff will be happy to assist you with the default network name of the hotel’s wireless service. When you arrive at the hotel, please contact our front desk staff, so that they can give you a voucher with a username and password details. When using the internet, please understand that you will be responsible for your own online security. Please note that the hotel will not be responsible for any loss or damage caused by unexpected outages or system faults. Please be considerate of other guests and refrain from downloading heavy files or playing online games for long periods. We love offering more value to our guests when booking directly with our hotel staff, or through our portoazzurro.com.mt website. 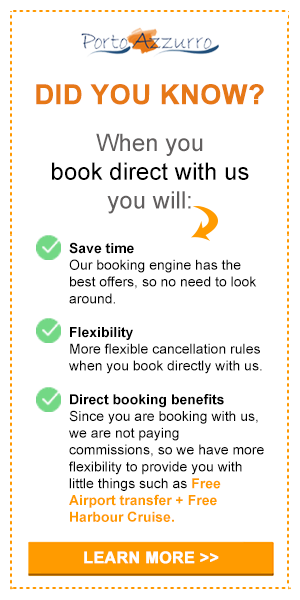 You can see all the benefits and advantages of booking directly with us here: Direct Booking Benefits. Porto Azzurro…Your 3 Star Choice!